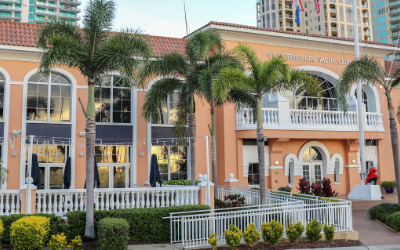 Situated in a bustling arts community on the downtown St. Petersburg waterfront, the St. Petersburg Yacht Club has been a part of the sailing community for over 100 years. We pride ourselves in creating a relaxed private club atmosphere with a warm, friendly, family-oriented atmosphere. We offer a wide variety of social activities and our Clubs Within a Club meet a plethora of special interests for our members where they can mix and mingle. What's happening at St Petersburg Yacht Club?